Julie A. Fast is one of the top bipolar disorder management experts in the world with four bestselling books on the Amazon.com mood disorder bestselling book list. Her treatment plan described below, The Health Cards Treatment Plan for Bipolar Disorder is only available off her websites. Julie was diagnosed with bipolar disorder two with psychotic features in 1995. (We now call this schizo-affective disorder.) Julie trains health care professionals around the world on how to use this plan with their clients. Whether you have bipolar disorder or care about someone with the illness, Julie’s books can help you and your loved ones find stability. Do you need a management plan that works with your medications? Would you like to manage bipolar disorder without medications? I’m a big believer in medications for bipolar disorder- when they work. I also know that we need a management plan in case the meds don’t work or we don’t want to take meds. The Health Cards work with and without medication. That’s a pretty bold statement. If you or your loved one’s bipolar disorder simply isn’t getting better, I challenge you to try the Health Cards. I use them every day. I still deal with mood swings- a lot, but you can see what I have accomplished. You can work, have relationships, travel and make money once bipolar disorder is under control. It’s all explained in the Health Cards Treatment System for Bipolar Disorder. It is possible to treat this illness successfully. I do. I created the Health Cards plan for anyone diagnosed with bipolar disorder. They are also an invaluable tool for those who care about someone with the illness. What are the Health Cards? 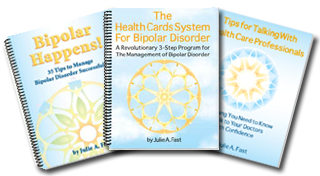 The Health Cards are a Revolutionary 3-Step Program for the Management of Bipolar Disorder. I created this system in 1998 when medications alone were not enough to manage this often debilitating illness. I and everyone who cares about me uses the system I teach in my Health Cards book. This includes my family, friends and health care professionals. The Health Cards System is a practical, hands-on program (in book form) designed to be used by individuals with bipolar disorder as well as their partners, family members and friends. You are given step-by-step instructions for creating customized “Health Cards” for each of your symptoms, whether it’s a mood swing, behavior, or relationship difficulty. Then you are shown how to break each of these down into the various signs, symptoms and triggers associated with it, as well as discover the specific behaviors that you and the people around you can do to lessen and prevent it. What has made the Health Cards System so popular and so effective is that it treats all the various symptoms and mood swings of bipolar disorder, not just depression and mania. Symptoms like anxiety, irritation, anger, relationship problems, attention problems, mixed episodes, psychosis, paranoia, obsessive behavior, suicidal thoughts, etc., are all uniquely addressed in the system. There are 66 pages of sample Health Cards filled with literally hundreds of the most specific and commonly reported bipolar symptoms, signs and triggers. You won’t find a more thorough or comprehensive list like this anywhere. The Health Cards System is not just a book. It is a practical, hands-on tool. You can refer to the Health Cards at any time, carry them with you, and rely on them whenever the occasion arises. You can update them as you progress or change them as your particular symptoms change. There is no bipolar disorder management program like this available anywhere else. This is the main book containing the actual Health Cards. The Health Cards System for Bipolar Disorder is 129 pages of the best investment you will ever make for a clear understanding of the management of bipolar disorder. Used by hundreds of thousands of people around the world, the system is clearly explained, easy to implement and guarantees you will cut your bipolar disorder symptoms by 50% or more. The Health Cards System for Bipolar Disorder also teaches partners and family members how to improve communication with their loved one and assist them in maintaining stability. The system works for adults, teenagers and young children with the illness, though children will need parental assistance. Bipolar Happens! 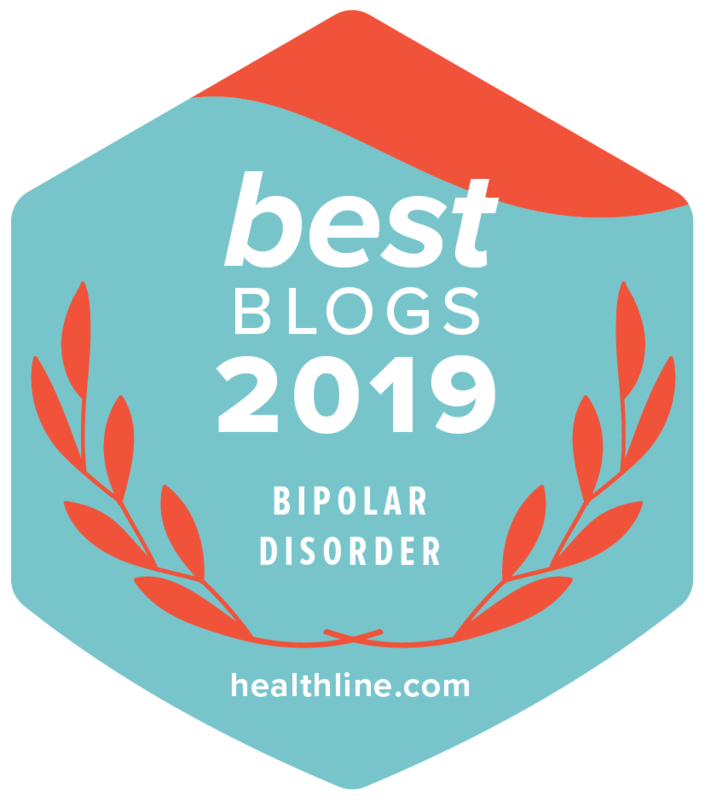 35 Tips to Manage Bipolar Disorder Successfully is the first companion book to the Health Cards, providing 73 pages of inspiration for those with bipolar disorder as well as invaluable information for those who don’t. Written with a stark and riveting honesty as only a person with the illness can do, Bipolar Happens! offers practical knowledge and deep insights into what it is like to live with bipolar disorder. Compelling, insightful and laced with humor, many of Julie’s readers credit this book as being their personal catalyst for change. “When I read this book I actually felt that someone really understood me, and it made me feel hope for the first time since my diagnosis,” wrote one reader. The second companion book to the Health Cards, Tips For Talking With Health Care Professionals consists of 41 pages of information to help you build better relationships with doctors and other health care professionals. Have you ever had the experience of having a lot to say to your doctor but when you get there there’s not enough time? Learn how to make the most of your office visits and communicate with your doctors successfully. 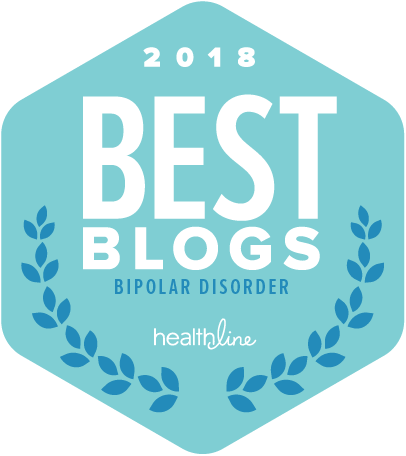 Based on Julie’s personal experience plus interviews with hundreds of other people with bipolar disorder, these tips will help you communicate with all types of health care professionals no matter what the situation. It also offers invaluable information for family members who have a loved one in the hospital. Buy with confidence, always safe, always secure online order processing. Since 2002, we have offered a 100% money back guarantee. No strings attached! Julie’s books are available in download versions and hard copies. All hard copy orders include the download versions. Shipping is included for all USA orders. All hard copy books are shipped first class around the world. Outside the United States? Not a problem. A note to International customers: We have a discounted flat-rate shipping charge of $50 for all international orders. This is roughly a 25% savings on the actual overseas shipping costs for most locations. We cover the difference for you. However, we do apply this charge to all hard copy products, whether it is the three books in the complete system, or all six books in the ultimate bundle. To order please use the international blue ‘BUY NOW,’ link under the items below. The Complete Health Cards System! You will receive an automatic email with the download directions. Worldwide delivery is usually immediate, but it can take a few minutes for the email to arrive. CURRENTLY UNAVAILABLE The Complete Health Cards System! You will also receive an email with download directions. Books are shipped first class on all orders. CURRENTLY UNAVAILABLE International Order: The Complete Health Cards System! You will also receive an email with download directions. Books are shipped first class on all international orders. Plus THREE More of Julie’s Bestselling Books! Includes the Downloads and Spiral Bound Copies of The Health Cards Treatment System for Bipolar Disorder, Bipolar Happens!, Tips for Talking with Health Care Professionals and Julie’s Three International Bestselling Books, Loving Someone with Bipolar Disorder, Take Charge of Bipolar Disorder and Get it Done When You’re Depressed! Six Books Shipped First Class Around the World for a $50 Flat Fee. This is a 25% savings on most orders. Thank you for shopping with BipolarHappens. Since 2002, Julie has sold her management plan to people around the world. The plan works. You and your family can find stability. Please visit Julie at her Julie A. Fast Facebook page for the latest news including tips on how she uses her management plan in her daily life. She also posts management tips on her Julie Fast Books Facebook page. You can find her on Twitter @JulieBipolar and on Linked In under Julie A. Fast. Please feel free to send an email to (Julie Fast Books at gmail dot com) for any ordering questions. A note from Julie: I’ve used the Health Cards Treatment Plan for Bipolar Disorder every day of my life since creating the system in 1998. My partner was diagnosed with bipolar disorder one in 1994 and I was diagnosed with bipolar disorder two with psychotic features (we now call this schizo-affective disorder) in 1995. I wanted to save my relationships and get on with my life. I created the Health Cards to help myself calm down this raging illness. Over 20 years later, I still use the same system as do all of my family members and friends. People with bipolar disorder and the people who care about them need a daily management plan in order to stay stable. I hope the Health Cards prove to be as life changing for you as they have been for myself and especially my mother! I recently traveled to England. The Health Cards were the most important item in my suitcase. It’s a challenge to manage bipolar disorder, but life can be good.